Sara Sutton Picture Real Autograph. 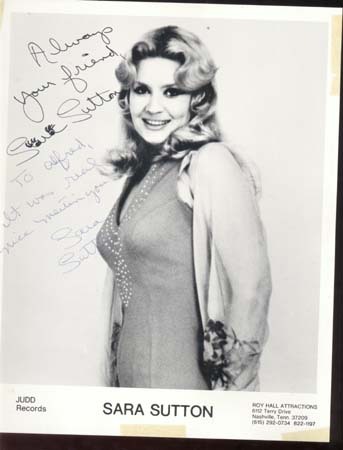 This is a Studio picture of Sara Sutton with her real autograph which reads in black ink, Always your friend, Sara Sutton. Then in blue ink she has written, To Alfred It was real nice meeting you. Sara Sutton. This picture is by Roy Hall Attractions of Nashville, Tenn. for Judd Records. A lovely autographed picture in excellent condition. Measures 8" by 9"
Items Similar To "Sara Sutton Picture Real Autograph"